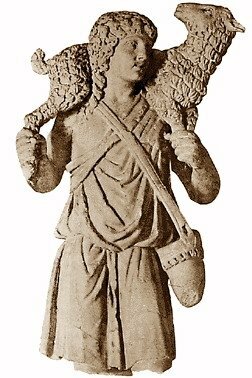 As opposed to the good shepherd, the hired man is marked by two similar yet distinct traits: self-interest and disinterest in others. A focus on self above all and a turning away from others. When the wolf comes, our Lord says, the hired man runs away. His one concern is about saving himself while he also has no concern for the defenseless sheep. We can say that Christ is, indeed, the freest person that ever walked the earth. Jesus’ freedom is not based in the grasping of pride (the sin of Adam and Eve) and the exerting of ones will over the other but in obedience to the Father. “…the Father knows me and I know the Father…” Jesus let go of the glory of God that was his due (Phil. 2:6-8) and, clinging to the guidance and movement of the Holy Spirit, aligned himself fully to the will of the Father. Jesus knew that true freedom that each one of us at our core and in those silent and alone moments in our lives both yearn for and know that we are indeed meant for. This is the freedom that is able to say in regards to laying down ones own life, “No one takes it from me, but I lay it down on my own.” This is the essence of true freedom: the ability and willingness to lay down ones life on ones own. The action of letting go of self, the action of turning toward the other in his or her need begets love. It helps to heal what is wounded within and it moves us toward that true freedom that is the defining characteristic of the good shepherd. There is a tried and true spiritual principle in this: if we find ourselves imprisoned in self-interest and disinterest then perform an act of gratuitous love, even the simplest of things and for even the briefest moment. In other words, for a moment turn your gaze away from yourself. Love begets love and it brings healing and freedom. It also brings hope. There is a very contemporary portrayal of this currently playing in movie theaters across our country. I have not yet read the books but last Thursday I saw the movie, The Hunger Games. At the heart of the movie (at least as I saw it) there is a moment where a young girl is killed in this competition that pits child fighting against child to the death. The heroine, who was trying to protect this young girl is heartbroken. But even in her pain and grief she does a tender thing. She gathers flowers and places them around the body of the young girl lying dead on the forest floor. In the cold world depicted in this story where, I would say, the sense of God has been lost (a world that at best can only say, “May the odds continually be in your favor.” rather than, “God be with you.”) the heroine performs a corporal work of mercy. She buries the dead and she does it in love. Via video cameras the nation watches this and in response in an imprisoned part of the country a riot against the injustice of the oppressors breaks out all because the heroine performed this simple act of taking the time to acknowledge the humanity and the dignity of this young girl. A humanity and dignity that all the “powers that be” were trying their best to negate. This Sunday is Good Shepherd Sunday and a day when the Church asks us to pray in a special way for vocations to priesthood and religious life. Our world needs all Christians to learn the love and the true freedom of the good shepherd and to be set free from the prison of self-interest and disinterest. But our world and our church also needs men and women specifically willing to answer the call to love and lay down their lives as priests and men and women living the consecrated life. To our young people in a special way I want to say this: know that this type of love and the freedom it brings is possible. We can live free of self-interest and disinterest. The act of love begets love. Christ has loved us to the end and we live in the grace of that love. 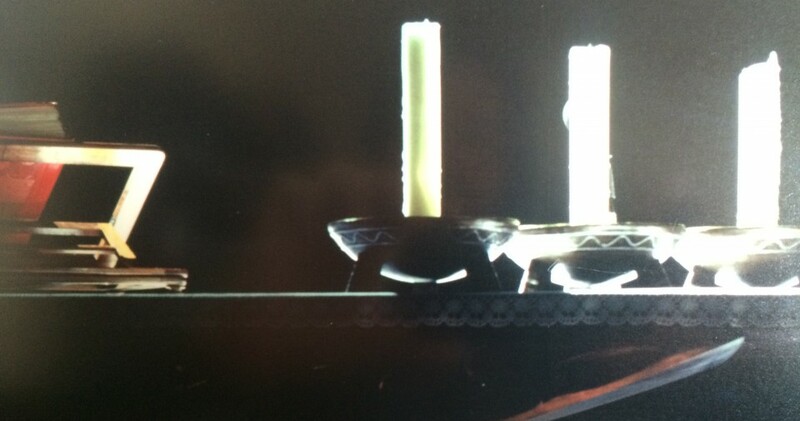 Third Sunday of Easter (B): "Something Happened"
That class and I would say specifically that statement “something happened” was one of the key components of my returning to the Church and the active practice of the faith. What enabled Peter (the one who had denied knowing Jesus) and those first disciples (the ones who had run away) the ability to move from fear to being bold proclaimers of Christ and the resurrection? Was it just a hoax they cooked up in their minds to steal the body away and see how long they could ride the “Jesus as Messiah” train? Hoaxes do not last so long (two thousand plus years) nor show such continued vitality. Was it that the “spirit” of Jesus had risen – his vision of the world and living together in harmony – while his body remained dead. But who willingly chooses martyrdom rather than denial for an idea (as we see throughout history beginning with those first fearful disciples)? 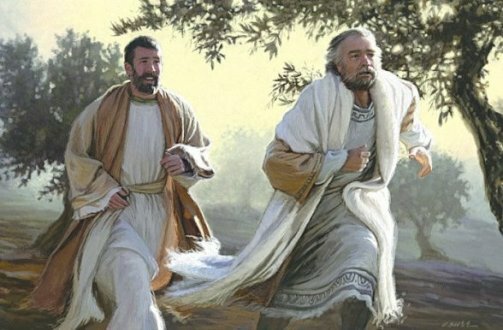 There are many ways to run from the scandal of the resurrection. We are all quite adept at it; both without and even within the Church. One such way (often touted as being an “enlightened” approach) is to see the resurrection as a nice idea – Jesus’ spirit continuing to live on. But today’s gospel is quite clear. Jesus is not a ghost. Jesus is risen – body and soul. He is the firstborn from the dead. Jesus is risen and he has not risen in vain. If we are to be christian then we must be willing to encounter the fullness of the resurrection; that “something that happened” as my professor said so many years ago and in that encounter we must be willing to make a fundamental faith statement, “I believe”. Only this will move us from fear to peace. This encounter and the peace and courage it alone brings continues today. Recently Pope Benedict (who is Peter in our midst) travelled to Mexico and Cuba. In the face of the chaotic violence of the drug trade engulfing Mexico (estimates of around fifty thousand people killed) this eighty-five year old man proclaimed firmly and resolutely that drug trafficking is a sin and it is wrong. Then going to Cuba at a Mass where the very Cuban government sat in the front rows, again this elderly man who has no armies behind him nor economic might called for greater freedom. What enables him to do this? If one reads his two books on Jesus of Nazareth or listens to any of his words one quickly realizes the answer. This man has encountered Christ risen and alive – not an idea of Christ, not just the spirit of Christ – but Jesus Christ himself and he has made his faith statement. The peace is there if we are willing to encounter and if we are willing to profess. Every Sunday when we gather for the Mass we profess the creed. What Thomas says in today’s gospel, “Unless I see the mark of the nails…” is, in fact, a non-creed and it is a non-creed professed by many people in our world today – not necessarily evil people but people who are prisoners of themselves and of their own sensations. Thomas, at this moment, was egocentric and lost in himself because he was lost in his own pain and crushed hope. He was focused inward – solely on himself. Even when the other disciples say, “We have seen the Lord!” he will not believe because he is so imprisoned within himself. Thomas will not even entertain the possibility. Egocentrism always leads one to unbelief – one becomes a prisoner to ones own sensations and cannot believe in anything else. Many people in our world live this way. We, ourselves, know the temptation to live this way. The temptation is always there to shut the doors, to turn in on ourselves, to live egocentric lives and to allow the entrance of only a select few, if even that. The danger is that egocentric lives easily become fear-filled and violent lives. The “other” can quickly become the “enemy” and mistrust can settle in our hearts. 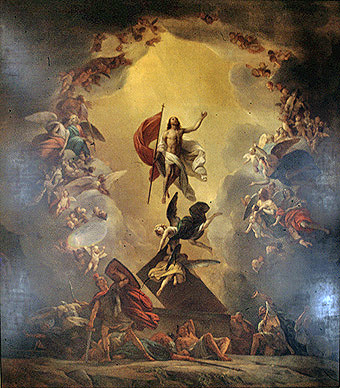 It is important to note that both times when the risen Lord appears in this Sunday’s gospel (Jn. 20:19-31) we are told that he easily passes through the locked doors and says, “Peace be with you.” The resurrection demonstrates that there is now another way. We do not have to live behind doors locked in fear. We can know peace! In the Divine Mercy apparition to St. Faustinia Jesus reveals his Divine Heart and the abundance of mercy which flows from it. In today’s gospel the risen Lord frees Thomas from the prison of his egocentrism by touching Thomas’ heart. 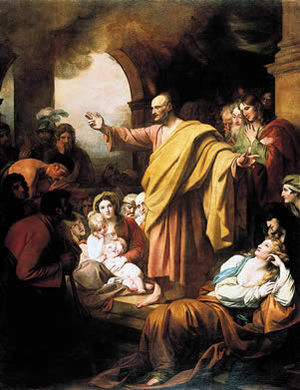 Jesus does not craft a well-reasoned argument or lesson for the unbelieving Thomas; rather, the risen Lord shows Thomas the marks of evil on his own body in order that Thomas might learn to turn away from self in compassion and be moved both by his wounds and the wounds of the least of his brothers and sisters. 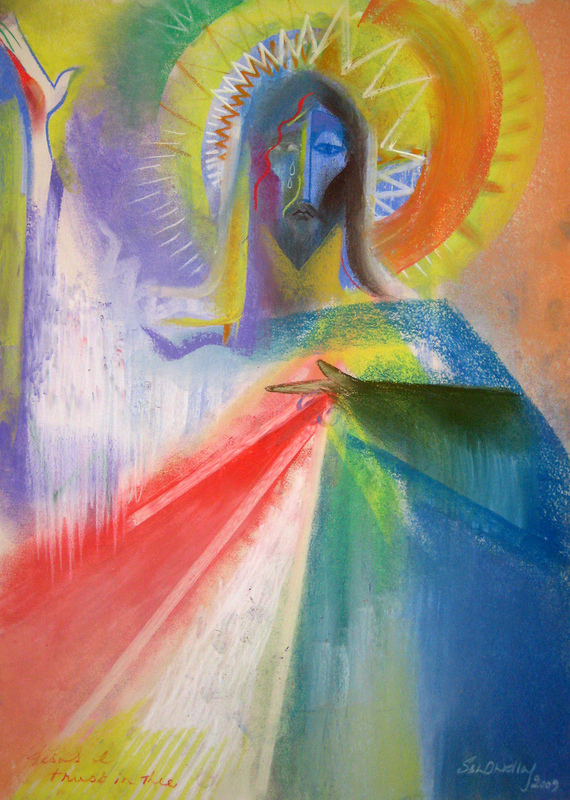 We are believers when we are touched in the heart, when we are moved at the sight of the wounds caused by evil and when we learn not to trust in ourselves and be focused solely on ourselves but to trust in the truth and energy of the resurrection and the divine love and mercy the flows from the gospel and that heals and frees from evil. Lord, we believe, help our little faith. Help us to open the doors of our hearts. Our Lord and our God! 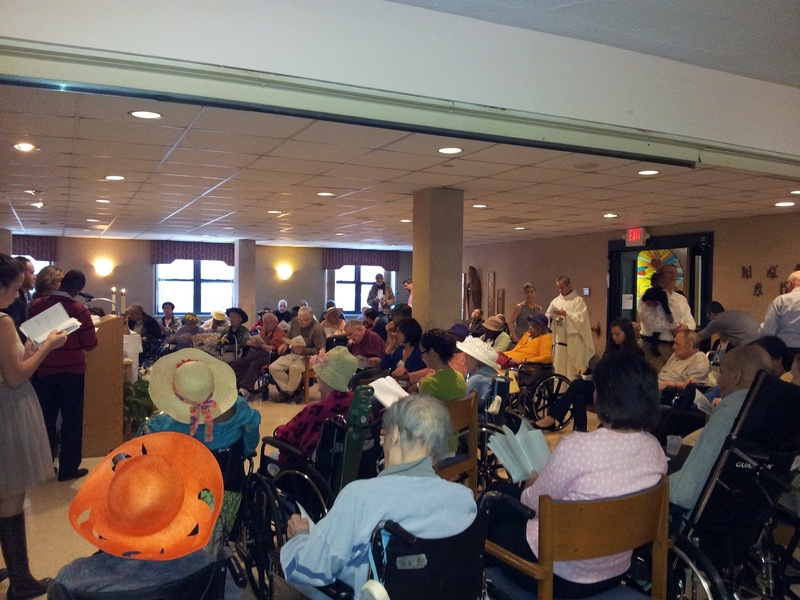 Easter Sunday Mass at Cabrini Nursing Home in Manhattan, NY. Sorry that I have not been posting lately. I have been on the road quite a bit between campus ministry work, vocation ministry and the Community of Sant’Egidio. I have just finished celebrating the Triduum and Easter with the the U.S. Community of Sant’Egidio at Mount Manresa Retreat Center on Staten Island, NY. (Being at the ETSU Newman Center allows me to be present to the community in this regard. The majority of the ETSU community head home for Easter so I can be present to the Sant’Egidio community.) It means a lot that the Sant’Egidio community has a priest to celebrate these days with them who understands the spirituality and charism of the community. It also means a lot to me and continues to nourish and strengthen my own discipleship. Even in the sadness of Cabrini closing we know that Christ is risen and that Christ is Lord and we give thanks for all the resurrections experienced at Cabrini over the years!